Halloween decor can have so many different looks, from spooky to chic to traditional and modern! 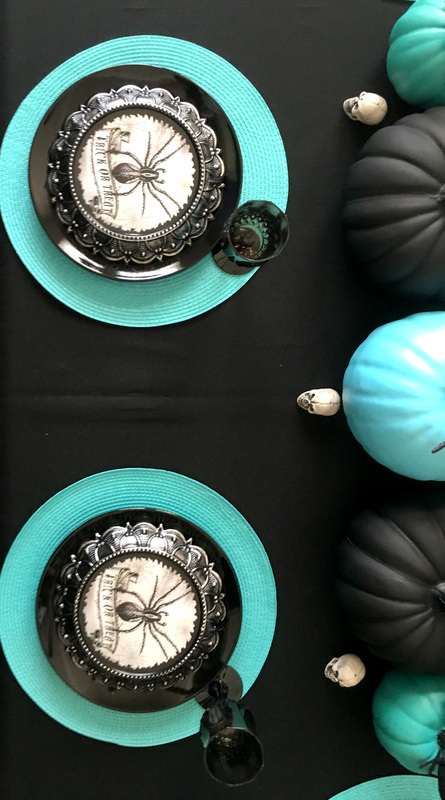 Using decor from At Home, we styled two main areas of our house, a spooky but fun Halloween front porch and a chic tablescape. 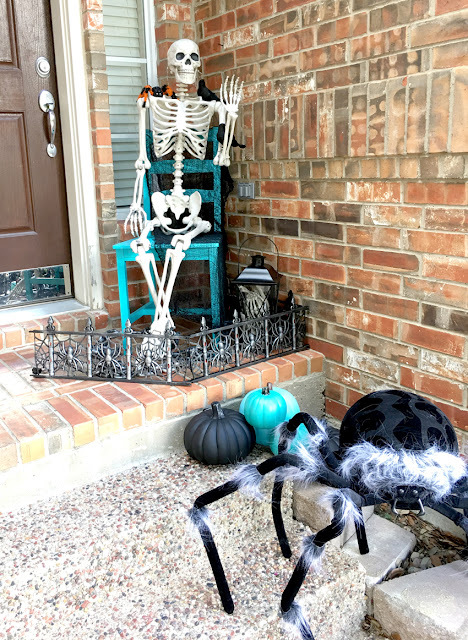 Creating Halloween front porch curb appeal doesn't have be a daunting task! We will share a few tricks with you to make it easier. 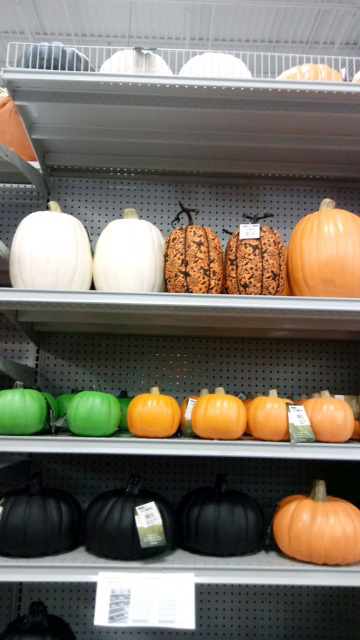 Head to your local At Home store, where they provide a full solution for your home, with a large selection of specialty products for Halloween. 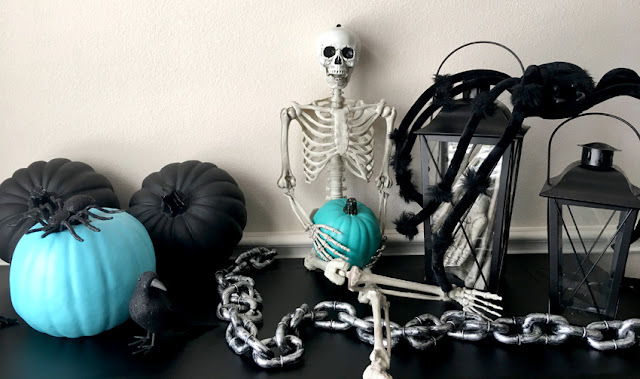 Here is the list of items we picked up, the life size poseable skeleton, a few black crows, bag of bones, spider fence, giant black spider, striped spider, smooth chain, chain with shackles and a few colorful pumpkins. We started with a wooden chair, we painted to match our decor. 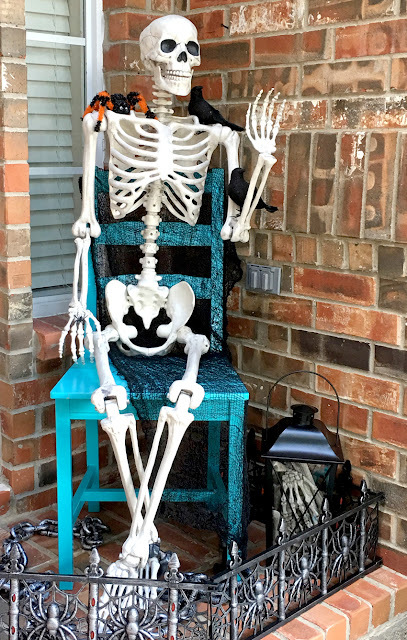 Draped a creepy cloth over the chair and sat the life size skeleton down and posed it waving at friends and family. 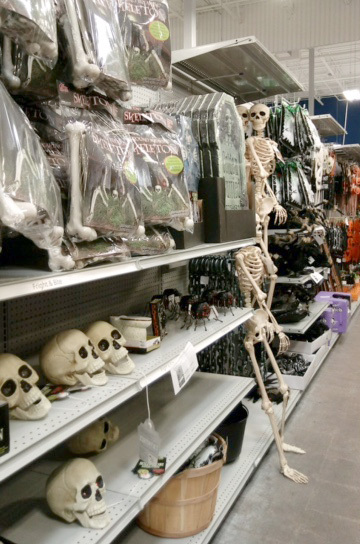 Add a spider and a few black crows to the skeleton's body, for a fun flair. 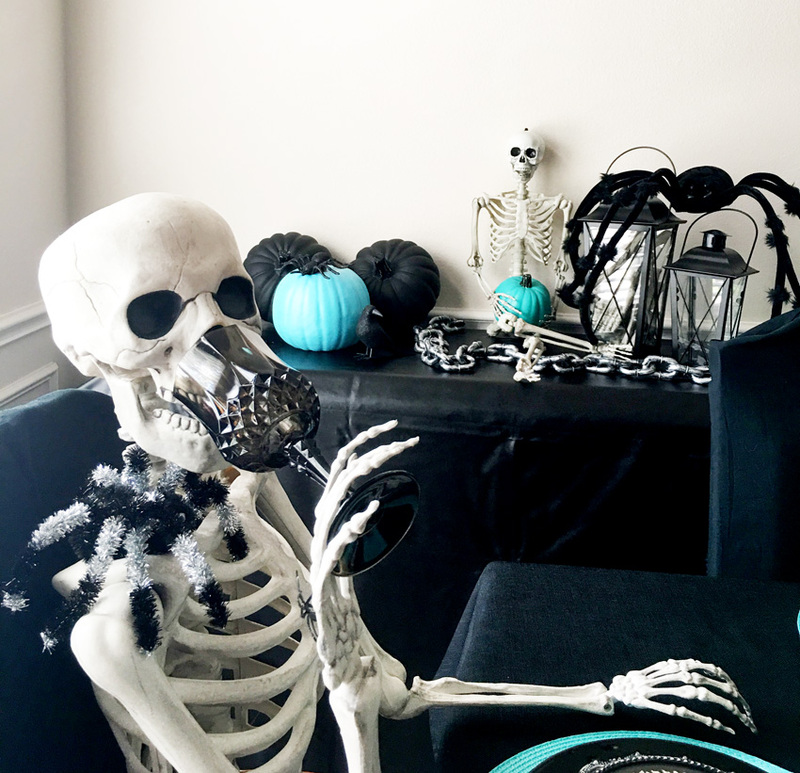 Take the two chains and wrap them around the chair and the skeleton's feet. Place the bag of bones in a black lantern or vase for the full creepy effect. Next add the spider fence around your display and you can call it quits. 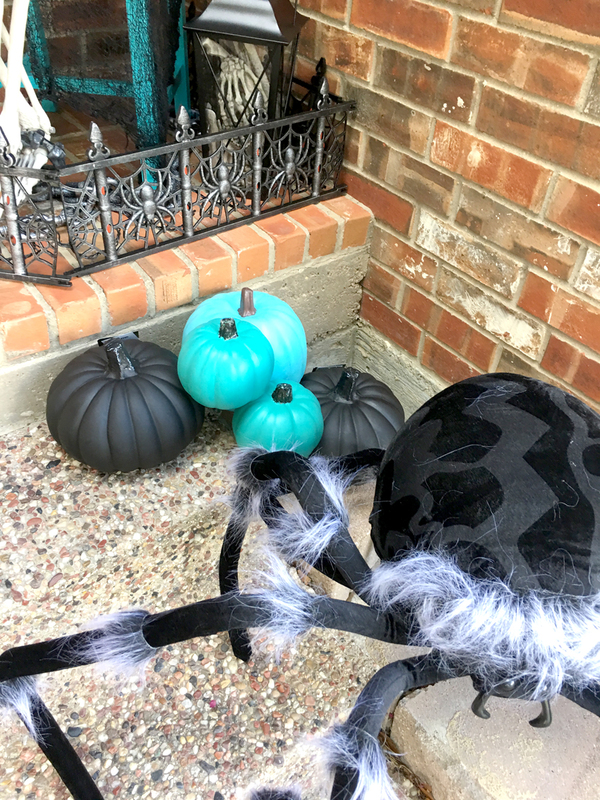 But if you'd like to add more, like we did, simply add the fun colored pumpkins and the giant spider to the stairs, if you have them. Our chic and modern tablescape is one you will want to take note of, especially because of the everyday low prices At Home has, it allows you to decorate on a budget. 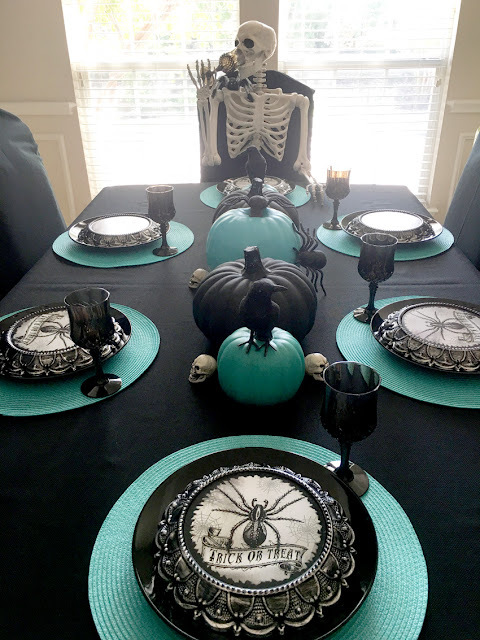 You will notice we used some of the same decor elements you saw on the front porch. 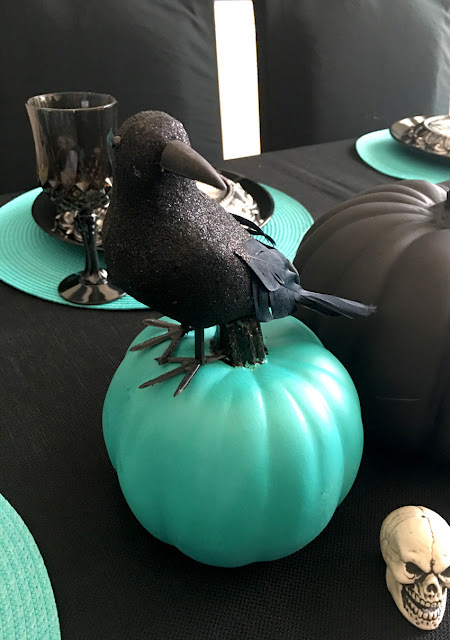 We decided not to go with the traditional orange and black, but instead with the turquoise pops of color. It adds a little mystery and chicness. 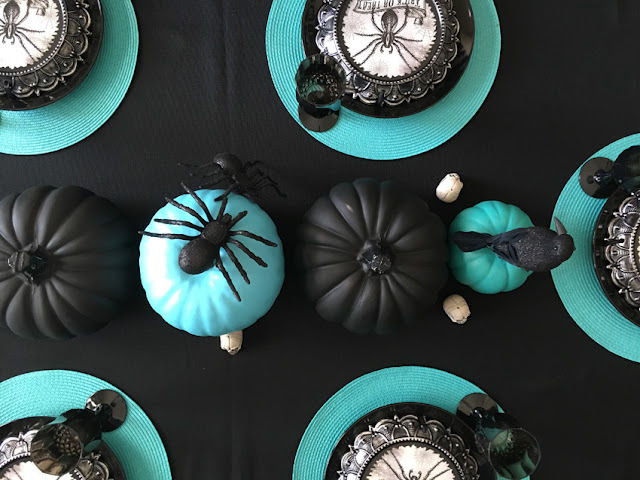 Aren't the place settings fabulous? 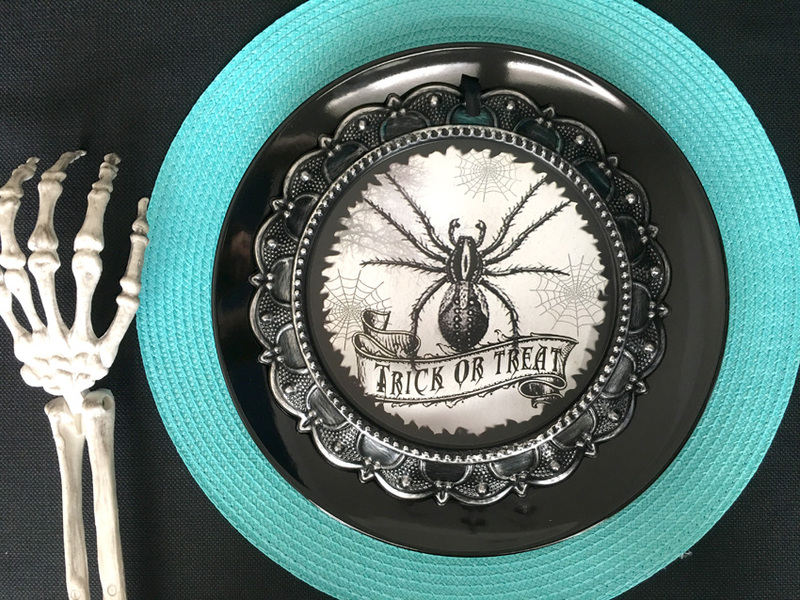 We found these metal spider wall plaques in the Halloween section and just could not pass them up! We knew they would be perfect on the table and they are the perfect size. 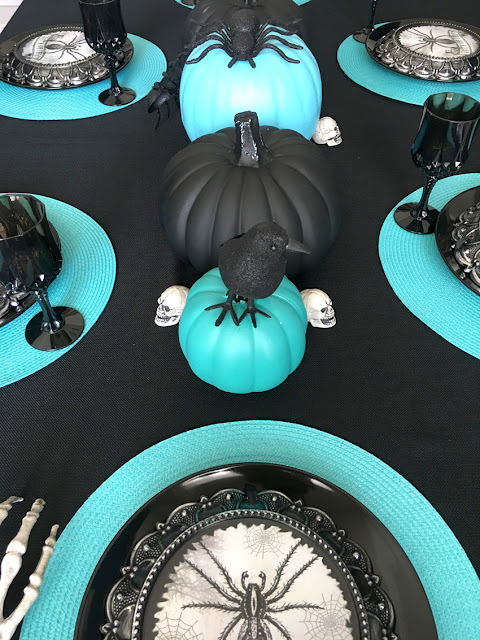 The black crows, mini skeleton heads, spiders and colorful pumpkins make this table perfect for your Halloween soiree. 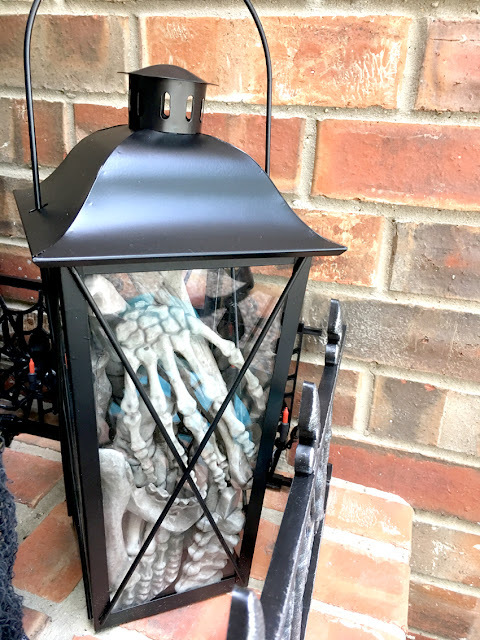 Have fun with your decor, like we did when we posed the life size skeleton drinking from his wine glass or this one above holding a mini pumpkin! 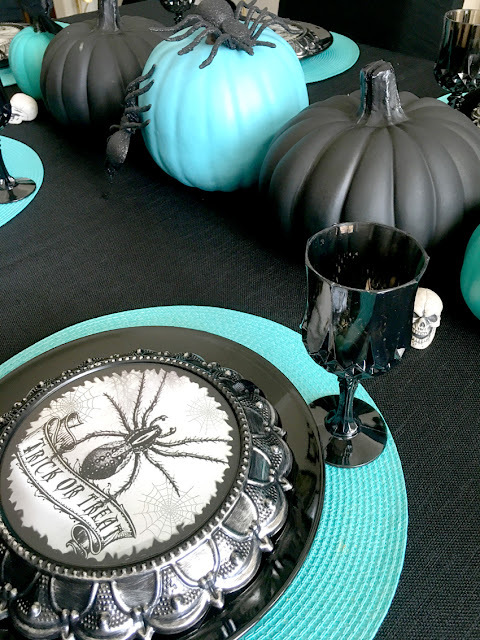 Halloween decor is all in how you style it. 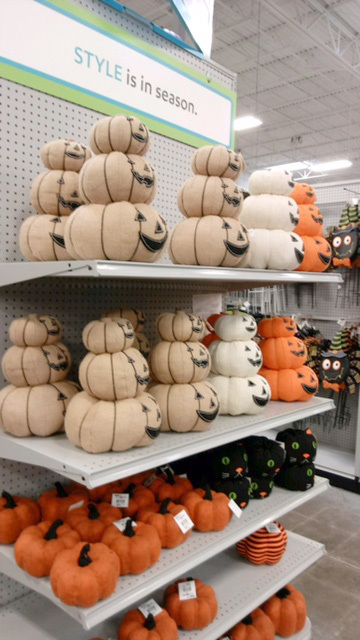 It can be fun, creepy, traditional or modern. Whatever you do, make it your own and have fun! 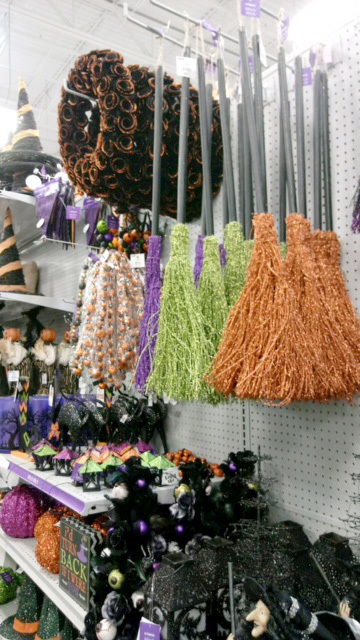 Don't forget to check out the full Halloween collection At Home here. This is a sponsored post written by me. BellaGrey Designs has received trade, products and/or payment from At Home, in exchange for promotion. All opinions and text are my own and I only promote products I love.